With discussions for resolving the partial federal government shutdown seemingly at an impasse, some are concerned about the shutdown’s impact on two components of the air travel system: air traffic control and airport security. The best way to prevent negative impacts would be to reduce the federal role in both of these areas. Doing so would also bring additional benefits. 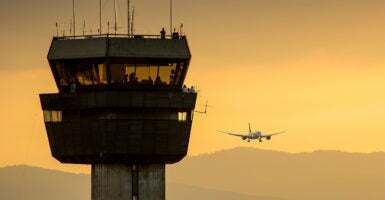 The Department of Transportation’s air traffic control system and the Department of Homeland Security’s Transportation Security Administration are both caught up in the shutdown due to spending bills for their respective departments not yet having been signed into law. As a result, many travelers are facing longer security lines, and air traffic control employees are voicing complaints about having to work without pay. While most shutdown discussion revolves around casting blame and creative ways to prevent shutdowns from taking place, Americans should instead consider whether the federal government should be responsible for so many aspects of day-to-day life. In the case of air traffic control, Americans are shortchanged by a system that is bureaucratic and wildly out of date. This has meant higher costs and less functionality for airlines, which in turn leads to higher prices and more delays for passengers. A positive example lies to the north. Canada’s air traffic control system, which covers a similarly large amount of territory, was turned over to a private nonprofit in 1996. The result has been lower costs and faster technological development. If Canada could manage that transition two decades ago, surely America can do the same today. In a similar vein, the TSA’s airport screening work does not need to be performed by federal employees. It’s understandable that changes were made in an attempt to increase airport security in the aftermath of the Sept. 11, 2001, terrorist attacks. But private-sector screeners can handle the task of seeking to prevent weapons and explosives from being brought on board airplanes just as well as unionized federal employees. Private providers have better incentives and stronger accountability, making them preferable to government providers in most cases. Handing over some tasks to private providers would allow the TSA to focus on regulation and oversight, rather than implementation. As with air traffic control, we can look to the positive experience that other nations have had in privatizing airport screening. In Canada, privatized screenings cost 15 percent less per passenger compared with those in the U.S. The Heritage Foundation’s “Blueprint for Balance” estimates that privatization would produce $465 million in savings in 2019, with additional gains for passengers in the form of lower security fees. The federal government attempts to do far too many things. Reducing the power of Washington would make the nation less dependent on politicians for the provision of services like air traffic control and airport security. Given the current mess in Washington, the notion of relying on politicians less seems like a very good idea.